Azores Ponies are from the Azores islands, Portugal. They have a wedge-shaped head and a straight or slightly rammed profile, with a wide forehead and a small mouth section. Their neck is strong and goes into a long shoulder. Their chest is deep, but narrow. Their hindquarters are somewhat poor. They generally are brown. Azores ponies are wiry, noble horses with a fiery temperament. They are used in agriculture, but they are also used as children's ponies. Azores ponies are very similar to Balearic ponies. Azores ponies are a very rare breed, whose origin is not fully understood. It is assumed that horses or ponies from Morocco were imported into the 19th century, and that these took a not unimportant influence. 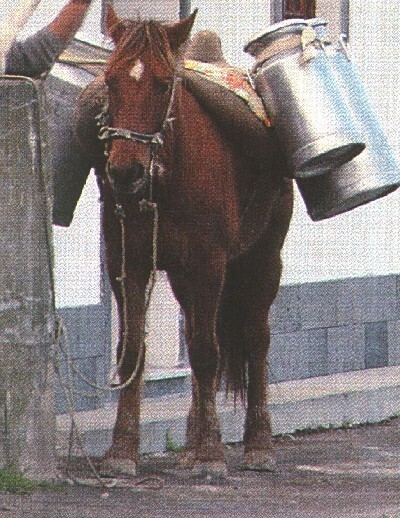 Typically, Azores ponies seem to have little in common with the Portuguese horses (Lusitanos), although it is assumed that occasionally a refinement with the luxury horses imported from the mainland took place. Domingos da Costa Oliveira reported in his book on Iberian horses of 1906 that at least a Moroccan stallion named Califa was brought to the islands around 1872 and used for breeding. Very similar to the Balearic pony, the Azores pony is a very rare breed whose origin is not fully understood. It is assumed that horses or ponies from Morocco were imported into the 19th century.